Bonikowsky, Laura Neilson. 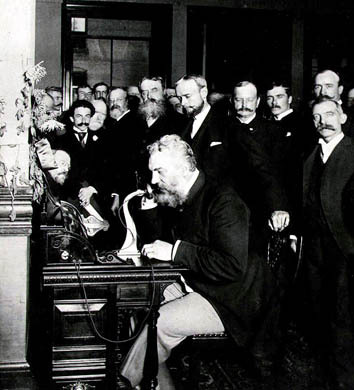 "Alexander Graham Bell and the Invention of the Telephone". The Canadian Encyclopedia, 25 January 2019, Historica Canada. https://www.thecanadianencyclopedia.ca/en/article/whats-better-than-bells-telephone-feature. Accessed 21 April 2019. On a lazy summer day in 1874, resting in his favourite spot along the Grand River in Brantford, Ont., Alexander Graham Bell conceived of the telephone. He would write years later that "one observation leads to another." Bell had been musing on his work with "visible speech" and the "Harmonic telegraph." Watching the currents in the water, he reflected on sound waves moving through air. Two years later, March 10, 1876, he was speaking into the first telephone, uttering the now-famous instruction to his assistant: "Mr. Watson, come here, I want you." Born in Scotland on March 3, 1847, Bell came to Canada with his family in July 1870. The following year, he accepted a position in Boston to teach deaf students, but returned frequently to his parents' Brantford home. Driven by insatiable curiosity, Bell tended to work to the point of exhaustion. Whenever he needed rest he returned to Canada to recover his strength and his inspiration. Much of Bell's work can be described as a series of observations leading one to another. His work with the deaf led him to working with the transmission and reception of sounds. Bell taught visible speech by illustrating, through a series of drawings, how sounds are made. Deaf students learned to speak by seeing sound. Bell sits at the New York end of the first long-distance line to Chicago and inaugurates real long-distance telephone service in 1892 (reproduction Number LC-G9-Z2-28, 608-B Gilbert H. Grosvenor Collection, Prints and Photographs Division, Library of Congress). He helped his students become aware of the sounds around them by feeling sound vibrations. One teaching aid was a balloon; by clutching one tightly against their chests students could feel sound. Bell's interest in sound and communication developed his interest in improving the telegraph. In 1872 he read a newspaper article about the Western Union Company paying a hefty sum to the inventor of a telegraph system that could transmit two messages at the same time over one wire. He was excited by the possibilities. Even before leaving Scotland Bell had been intrigued by the idea of using a well-known musical phenomenon to transmit multiple telegraph messages simultaneously. He knew that a sound's pitch relies on its frequency-how quickly it vibrates-and that everything has its own natural frequency. By singing into a piano he discovered that varying the pitch of his voice made different piano strings vibrate in return. His observations led to the idea of sending many different messages, with tuning forks tuned to different frequencies, along a single wire, a system he called the harmonic telegraph. The message was received at the other end of the wire with identical tuning forks. To explore the reception of sound vibrations, Bell constructed an apparatus consisting of a sheet of blackened glass, a mouthpiece and a long wooden lever with a bristle on its edge, attached to a stretched membrane. A sound sent down the mouthpiece made the bristle move up and down on the membrane, tracing the shape of the vibration. When the membrane proved insufficiently sensitive, his friend, ear specialist Dr. Clarence Blake, gave Bell a cadaver ear to study. Bell applied his understanding of the human ear to the telephone. Bell returned to Brantford in 1874, exhausted. Mulling over all of his observations, Bell realized that with electricity, "it would be possible to transmit sounds of any sort" by controlling the intensity of the current. Based on his new insight, he sketched a primitive telephone. By October 1874, Bell's research had been so successful that he was able to inform his future father-in-law, Boston attorney Gardiner Greene Hubbard, about the possibility of a multiple telegraph. Hubbard resented the Western Union Telegraph Company's communications monopoly and gave Bell the financial backing he needed, along with leather merchant Thomas Sanders, the father of one of Bell's students. Bell worked on the multiple telegraph with a young electrician, Thomas Watson, but at the same time, he and Watson were exploring an idea that had occurred to him that summer for a device that would transmit speech electrically. Bell also met with Joseph Henry, director of the Smithsonian Institution, in March 1875 to discuss ideas for the telephone. 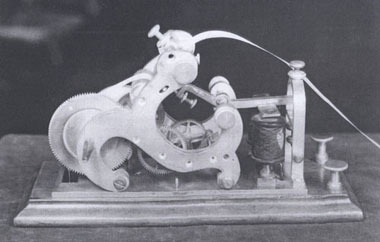 Hubbard was not particularly impressed by transmitting voices by wire and felt that Bell's work was delaying the development of the multiple telegraph. He gave Bell a choice: work on the electrical transmission of speech, or Mabel, Hubbard's daughter and Bell's future wife. Bell was determined to have both and wrote to Hubbard on May 4, 1875 about his work and his theories that "a continuous current of electricity passed through a vibrating wire should [induce] a pulsatory action....in the current." Hubbard was won over. The first major breakthrough occurred on June 2, 1875. Bell and Watson were preparing an experiment with the multiple telegraph by tuning reeds on three sets of transmitters and receivers in different rooms. One of Watson's reeds, affixed too tightly, was stuck to its electromagnet. With the transmitters off, Watson plucked the reed to free it and Bell heard a twang in his receiver. The plucked reed had induced an undulating current, using residual magnetism, and activated the electromagnets in Bell's receiver. They had inadvertently reproduced sound and proved that tones could vary the strength of an electric current in a wire. The next step was to build a working transmitter with a membrane that could vary electronic currents and a receiver that could reproduce the variations in audible frequencies. Within days Watson had built a primitive telephone. Bell continued to work with his invention after he formed Bell Telephone Co on July 9, 1877. He and his assistant, Charles Tainter, developed a device they called the "photophone," which transmitted sound on a beam of light. In 1881 they successfully sent a photophone message nearly 200 metres between two buildings. Bell considered the photophone "the greatest invention [he had] ever made, greater than the telephone." The telephone made him a rich man by age 35. He never stopped discovering and creating and he continued to find his respite in Canada, at the home he built in Baddeck, NS, a house he named Beinn Breagh ("beautiful mountain" in Gaelic).